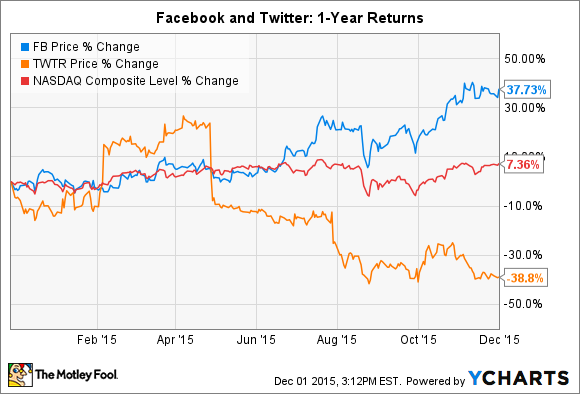 One day Facebook and Twitter will become better shopping outlets, and that's what investors should concentrate on. Although the nuances can be difficult to grasp, the social-media business model is relatively straightforward: Grow user views by a combination of more users or more time spent on the site by each user and then monetize that traffic by placing targeted advertisements and direct purchasing opportunities in the news feed. So when it comes to evaluating social-media companies, user engagement and active-user growth is an important part of the analysis. For a prime example of the importance, look no further than pure-play social-media companies such as Facebook (NASDAQ:FB) and Twitter (NYSE:TWTR) -- the former continues to grow users and timeline views, whereas the latter has struggled against expectations over the past year or so. In a recent article, Re/code author Kurt Wagner discusses the second part of the social-media business model: user monetization. Specifically, Wagner discusses the shopping experience on both networks in a first-person account (spoiler alert: it's not pretty). However, investors shouldn't view this as a negative, but as a future opportunity. Although the author is correct, this is nothing new for investors in these companies. Facebook has been experimenting with buy and other call-to-action buttons in its ads, but it's certainly not a large part of the news-feed experience. And that appears to be at least partially by design, as Facebook has actually decreased its ad load more recently to presumably improve the user experience. The company is in the test phase of creating a dedicated Shopping feed as a one-stop-shop for retailers, but, apparently, it's still not ready for prime time. It doesn't appear investors were looking for the Shopping feed to make a significant contribution to Facebook's bottom line -- yet. The company has been blowing past analyst estimates with its current strategy of growing users and engagement and improving the monetization with its native-video experience. As the chart shows, Twitter has other issues to address before worrying about a poor shopping experience. Most notably, the service has stumbled to grow monthly active users (MAUs) and now faces questions as to how large the service's total addressable market is. In another article, I argue that the service relies too much on promoting celebrities and other power users to grow MAUs and engagement, instead of a bottom-up approach. Right now, I feel it would be folly for Twitter to divert resources away from improving the product to promoting a top-notch shopping experience. I feel this will be successfully integrated into Twitter's site eventually, but it will probably be later than Facebook. In the end, though, I think one-stop shopping is an intriguing potential growth area for both companies, especially for Facebook, but just not at this juncture (perhaps soon, though). However, investors should look forward to the day it does contribute to net income in a meaningful way.